If your kids like the taste of the toothpaste then brushing can be fun for them. 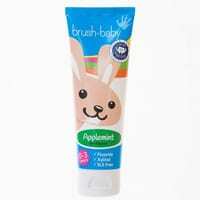 You can try a free tube of BrushBaby Applemint Toothpaste which is specially designed for kids. All you need to do is follow our link and create a free account on next page and then use their redirection link to go to KiddiCare and get it for free. Click on “GET IT HERE” button and then create a free account on TopCashBack website and then follow their link to KiddiCare website and search for this product and make a purhase. After you have bought it, TopCashBack will give you a 100% refund.